What’s the hardest thing about writing proposals? Maybe it’s responding to RFPs under tight deadlines, submitting bids on time, and getting each part of the proposal in line with the RFP guidelines. These are all critical to getting your grant, sales, and government proposals accepted. But in such situations, mistakes are bound to happen. Even more significantly, difficult working conditions may compromise the quality of the bid. Nonetheless, you can improve their position by considering the following questions before starting your next proposal. As covered elsewhere on this site, proposals need to be client-centric. 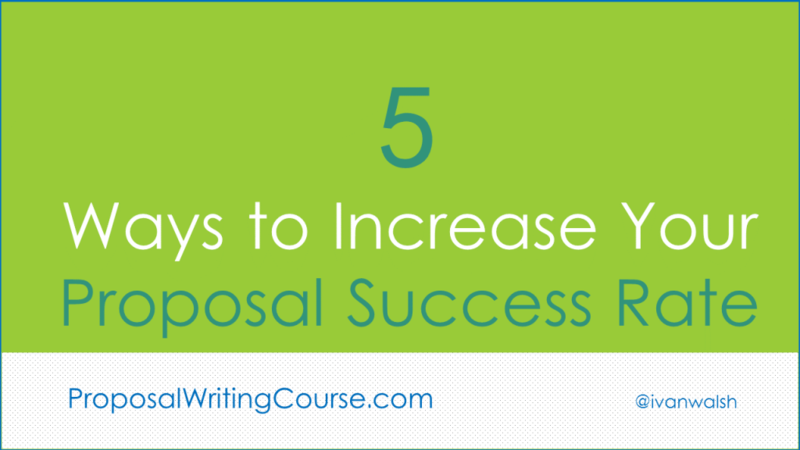 These proposals pinpoint the client’s specific issues (stated and unstated) which help you write a more effective proposal. 2. How do proposal evaluators see your company? Before bidding, your sales team should have prepared the groundwork with the prospective client. Pre-sales activities will ensure that the client has an idea of who you are—though maybe not as well as you would like—so that you are not submitting a ‘cold’ bid. A ‘cold’ bid is sent from a company who has had no previous contact with the government agency. Like their telephone equivalent, the ‘cold call’, they tend to have low success rates. If you are bidding to an agency for the first time, you can rectify this by submitting high-quality product brochures, cases studies and white papers. In addition, you can ‘get-to-know’ the evaluators during the clarification questions, briefing sessions and during the presentations. 3. How does the evaluator’s opinion affect the contract award? As mentioned previously, if you are new to them then they will generally remain neutral until proved otherwise. Opinions about your credibility, and potential as a winning candidate, will arise when they question your references, meet you in person, and examine the finer details of your bid, such as the terms and conditions. Evaluators know that references (e.g. referees) are unlikely to speak poorly about the bidding company and may not give much importance to this area—but they will contact the references anyway, as this is part of the formal evaluation procedure. To make sure you’re represented in the best light, speak to the references in advance and remind them of key areas to emphasize, such as how you delivered on budget, your reliability, and other value-ads. 4. Do the evaluators have preferred competitors? Explore the competitor’s perceived weaknesses i.e. where you can score points. If you cannot find solid arguments to dislodge the preferred competitors, you might want to re-consider the bid/no bid strategy. A typical area where competitors have an advantage is when the incumbent is bidding for an extension of an existing project. In this situation, the incumbent can identify certain areas where you cannot compete, e.g. knowledge of the existing systems. But, you can counteract this by stressing that your rates, flexibility, competitive bid, SLA, and value-ad make you a worthwhile candidate. Smaller companies can emphasis their speed, nimbleness and flexibility when competing against vast IT powerhouses. 5. How to position your proposal bid? When IT personnel write proposals, they often get sidetracked into detailing the system innards. If this is required, then fine. But otherwise, you need to keep these sections in check as they deviate from the proposal’s main objectives. Likewise, when Sales executives write proposals they can be guilty of adopting a writing style often referred to as ‘marketese.’ Most evaluators are not impressed with this, especially when the copy is snowed under with outlandish claims to product superiority etc. Essentially, you need to position your solution so that it is aligned exactly with their requirements. To be fair, you sometimes have to work very hard to unearth these requirements as not all Request for Proposal’s are well formulated—but that’s part of your job as a Proposal Writer. Once you understand this, write the solution description ‘point-by-point’ inline with their submission form. Don’t deviate one iota from the submission form as otherwise you will be disqualified. Be very careful when suggesting a solution that goes above or beyond the requirements. Most evaluators will interpret this as an attempt to out-wit the client. How Many Hours a Week Do You (Really) Spend Writing?